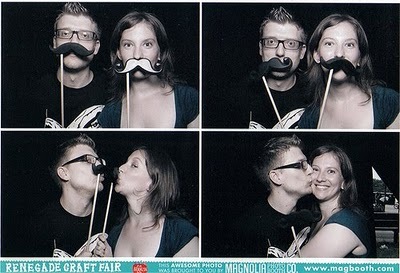 the brooklyn renegade craft fair was this past weekend and it was super awesome, as usual. the mister and i got there late in the day, but we still enjoyed it immensely. chris added to his ever expanding t-shirt collection with a stop to supermaggie, we found a christmas gift for my brother, i added to my letterpress card collection (with full intentions to mail out all three of the cards i bought within the next 6 weeks), and we managed to have our photo taken in a photobooth. all in all, a success. i didn't take a ton of photos, but here are a few peeks from the fair. chris loved this booth. i think he was kind of sad when he saw that someone had already bought the zelda piece. so many of the booths had pretty little details, like this. tons of great ink everywhere. i think next year, we'll just park ourselves on a bench for the day so we can do more people watching & tattoo spotting. and the completely RAD (& free!) photo booth provided by magnolia photo booth co. with props to boot!